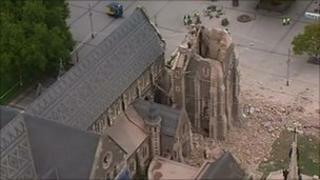 Image caption The tower on ChristChurch cathedral "imploded in upon itself". Christ Church cathedral in Oxford is sending prayers and donations to its sister cathedral hit by the New Zealand earthquake. The death toll from 22 February's 6.3-magnitude quake in the city has now reached 148 people. The Dean of the city's cathedral, The Very Reverend Peter Beck, described how his building was affected. "The tower had imploded in upon itself and part of the north west nave had collapsed," he said. He praised the commitment of the "extraordinarily brave men and women" who were still working across the city to rescue the people from the rubble. "We're just waiting, grief-stricken really, because already I know for myself as the names are beginning to come out that these are people that I knew. "Some of them I knew really really well so there's that sense of huge tragedy." ChristChurch Cathedral in Christchurch, New Zealand, was founded by members of the Oxford cathedral in the mid-19th Century. The current Dean in Oxford, The Very Reverend Christopher Lewis, said that words were not the answer in a disaster. "One wants to feel for the other people and not necessarily prattle on about it," he said. "It's a time when one wants to have empathy for them." Mr Beck thanked the Oxford congregation for their prayers. He said: "One of my tag-lines over the years has been that this cathedral has been a place where all faiths - and none - can feel welcome and at home. "It has been and in the future again it will be."